Fiction – paperback; Atlantic Books; 86 pages; 2000. 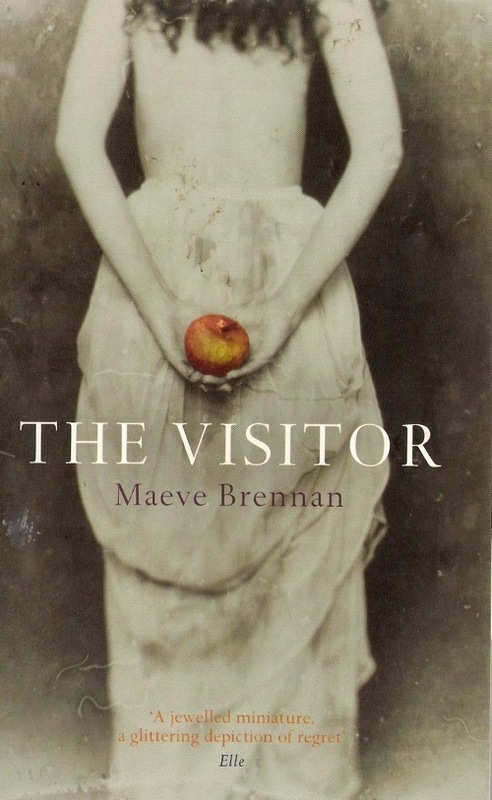 Maeve Brennan’s The Visitor is one of those exquisite novellas that encapsulates everything that is good about literature in one tiny, fierce package. It was first published in 2000, seven years after the author’s death, and its discovery was something of an accident. According to the “Editor’s Note” in this edition, the typescript was acquired by the library of Notre Dame University, when it purchased a job lot of business files from the Catholic publishers Sheed & Ward in 1982. No one seems to know exactly how the novella came to be in Sheed & Ward’s possession, but it’s believed that it was probably written by Brennan in the mid-1940s. By all accounts Brennan was an interesting character. Her Wikipedia entry states that she was born in Dublin in 1917 but moved to the USA in 1934 when her father became the first Irish ambassador to the country. She later lived in Manhattan, where she famously worked on The New Yorker magazine as a columnist and short-story writer. Her talent and beauty marked her as one to watch, but she had little eccentricities which later grew into mental illness. By the 1970s she was an alcoholic and homeless. She died in 1993 after years of hospitalisation. The Visitor, easily devoured in one sitting, is a bittersweet homecoming story in which22-year-old Anastasia returns to Dublin after living in Paris for six years with her mother. Her mother died a month ago, so Anastasia is at a bit of a loose end. Her best option is to go back to the house in which she was raised to live with her paternal grandmother, Mrs King, who is still grieving over the death of her son — Anastasia’s father. But this is where things go a little awry, because Mrs King is a hard woman with nary a charitable bone in her body. She does not want Anastasia to live with her. She is distant and cold, her voice “cool and unemphatic”, and she “smiles with anger”. In a narrative that swings between the past and the present, we learn that Mrs King never liked her daughter-in-law, who was much younger than her son and prone to emotional outbursts at the breakfast table. She believes that “she disgraced us all, running off the way she did, like some kind of madwoman”. She turned the spectacles thoughtfully in her hands. The tension between these two women of different generations — the younger who brims with emotion and the older who keeps emotion at bay — is what makes this novella such a riveting read. And because both of them have different loyalties — a daughter trying to do the best thing by her mother, and a mother wanting the best for her son — means they will never see eye to eye. The crucial point is that Anastasia is willing to move on emotionally, to let bygones be bygones, but her grandmother is not. While Mrs King comes off as a monstrous creation, her cool, calm manner makes her totally believable. She never becomes a caricature. But she only truly works in stark contrast to Anastasia, who is a young woman full of love for those around her, including Mrs King’s housemaid, Katherine, whom she lavishes with Christmas presents, and Mrs King’s elderly friend, Miss Kilbride, whom she visits regularly for tea and cake. In fact, Anastasia is so desperate to be loved in return she cannot comprehend her grandmother’s inability to make her feel at home in her home. This is a story about love and loss, about grief and death, about relationships between children and their parents, and how our loyalties can be skewed by all kinds of things, including jealousy, prejudice and age. It’s also a story that focuses on nostalgia, atonement and our inability to correct past wrongs. But ultimately, The Visitor focuses on the notion of home: what it is, where it can be found and how it affects you when it changes in your absence. Although I had heard about this novella in the vaguest of terms over the years, I must thank Claire from Paperback Reader for reminding me that it was a book I had to read. A warm review of a warmly-remembered novella, Kim. I am thrilled that you read and enjoyed it as much as I did. This was one of those great finds -mentioned in a Guardian article- that I’m glad I acted upon. A very persuasive review of a novella which I have not heard of, Kim. I find it interesting because in Colm Toibin’s new short story collection, The Empty Family, he explores similar themes in a number of the stories. I am particularly intrigued by the portrayal of the irresolvable conflict that is produced by (completely understandable) conflicting loyalties. Great cover as well — is that an onion she is holding? Or am I just making that up? Thanks, Claire. It’s one of those books that’s a real gem. I don’t often re-read books, but I’m keeping this one, because I know I’ll return to it at a later date. She’s holding an apple… which makes me wonder if this is symbolic of Snow White and the Seven Dwarves, so that Anastasia is Snow White and Mrs King the wicked Queen… but maybe I’m reading too much into it? I think you’d like this story, Kevin. It’s got all the best elements of Irish writing — the restrained, but hugely evocative, prose; the ability to capture emotion without spelling it out; and dialogue, which is spot on. As for the apple, I’d be inclined to go all the way back to the Garden of Eden — but then we have to remember that it is only the designer’s take on the story anyway. I agree with you on the notion of the Irish diaspora and “home” and its influence on Irish fiction. As your own recent experience illustrates, the return “home” tends to bring into sharp focus what you remember, what you didn’t and what has changed in the meantime. Good writers like the two we are talking about here have a way of capturing that experience. I’m intrigued by the cover too, and I thought Garden of Eden as well – but what’s the forbidden knowledge, and why is the apple concealed behind her back? In days gone by a cover like this would have impelled me to read the book because of these interesting cover twists on an allusion. But Kevin’s right that it’s just the designer’s take on it, and these days when designers are not as valued as they were (possibly because they don’t know as much about classical mythology and religious symbols as they might), often the cover image is simply selected from somewhere like Getty Images whether the image really fits the story or not. And then a title is slapped over the top of it – but this title is interesting: The Visitor. A grand-daughter coming *home* (to that house, to that country) is a visitor? The notion of Anastasia returning home as a visitor is well played out: she thinks she’s home for good but she’s treated by everyone, including the housemaid, as a mere house guest. And, yes, I do think this theme is well explored in just 86 pages. That’s what makes the story so powerful and why I admire writers like this so much: they say so much in so few words it makes you wonder why today’s writers think they haven’t arrived until they’ve written a 600-page doorstep of a novel. I’m not at all familiar with this Brennan story. I have a book of her short stories and essays, though, and have enjoyed her writing. I had heard some interesting stories about her as well–one that she had been living in a bathroom (well something along those lines) at the New Yorkers offices. It’s a little sad really, but she seemed an intriguing woman. I’m adding this one to my wishlist. I’m not familiar with Brennan at all. In fact, I am becoming more and more aware that there is an entire period of literature written between the end of the first world war and the late sixties about which I know nothing except the drama. I would say that some serious reading needed doing, but where is the time? Thank you, at least, for another name to go on the list. I picked up a cheap copy of a biography of Brennan, and I see now I must get around to reading it. This novella sounds wonderful and I will be looking out for it now. Fascinating the way publishers fool around with different covers, isn’t it? Maeve Brennan had a regular column in the New Yorker, but then she got to sleeping in the hallway until they moved her out. She had two books of short stories, one called ‘The Rose Garden’, not sure about the other, both are really good. Danielle, there’s a foreword in this edition by Claire Boylan which gives a bit of background to Brennan’s life — and yes, she apparently did spend some time living in the toilets in the New Yorker offices. The mind boggles. I’m not very familiar with that era either, although there are some bloggers who seem to specialise in 1930s-1940s fiction. I bet her biography’s a very good read — she seems to have read an interesting / unusual life. From what I’ve gleened very briefly, she seems to have been a very bright star who burnt out quickly — and tragically. According to Wikipedia, the second collection is called “The Springs of Affection: Stories of Dublin”. I think it’s one I am definitely going to have to add to the wishlist. I do like fiction that is a “tiny, fierce package”. It takes great skill to distill a story down to its essence and find just the right words, because at only 86 pages there is no space for even one unnecessary word. I get tired of the bloat that seems to be part of so many novels these days.